Please read the following notes carefully, making sure that you check the scripture references in your own Bible. (a) Because Christ Himself set the example. (b) Because Christ commanded His disciples to do this. (c) Because the New Testament church practised it. 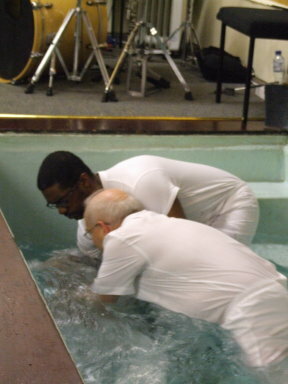 3. WHO MAY BE BAPTISED? (b) Only those who have truly repented of their sin and turned in faith to Jesus Christ, receiving Him as their personal Saviour. (a) We should definitely seek to be filled with the Holy Spirit. (b) We must seek to live a life consistent with the profession we have made in Baptism - that is. a life of personal obedience to God's Word. (c) We must take our place in the local church as a member of the Body of Christ, sharing in its worship, fellowship and witness.